Join the experts for an exciting weekend of lectures, discussions, and a guided tour of where it all began: the tobacco farm where he had the visions that prompted his life’s work; Beverly School, where Cayce manifested his strange powers of mental telepathy; the church where he worshiped; the home where Cayce gave his first trance reading; and the office where he partnered with Dr. Wesley Ketchum to bring his astonishing trance readings to the world. 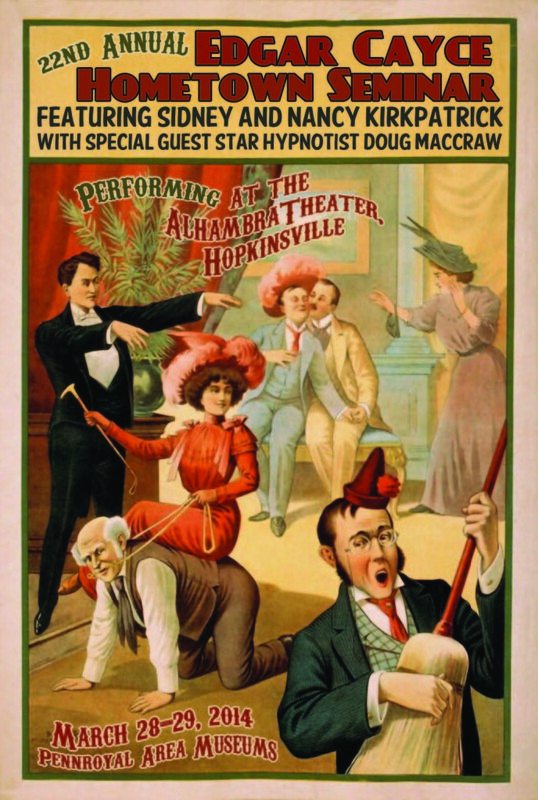 Climaxing this fantastic weekend will be celebrity hypnotist Doug MacCraw performing at the historic Alhambra Theater. Dare to join others on stage to see how it all began for Edgar in his own hometown. Maybe the next Edgar Cayce is already among us! Call the Museum to register at (270) 887-4270! The New York Times once named psychic Edgar Cayce “the most fascinating man in America.” He was called upon by world leaders (such as Woodrow Wilson), prominent scientists (such as Thomas Edison and Nikola Tesla), chief executives of major corporations (Goodyear Tire and Rubber Company, NBC and Paramount Studios) and studied by deans at both Harvard and Columbia Universities. Treasure hunters, stockbrokers, and oil-men made millions of dollars from his talents. Marilyn Monroe used beauty aids recommended by Cayce, and George Gershwin sought medical advice. Join critically acclaimed best-selling author and Yale University Pulitzer Prize nominee Sidney Kirkpatrick, the first biographer to be granted unrestricted access to Cayce’s voluminous personal papers, to understand how a poor Kentucky farm boy, whose career began in a vaudeville theater on Main Street, Hopkinsville, would go on to touch the lives of countless millions the world over. Invented by Cayce in the early 20th century, this card game is exciting, social, and fun. No experience is necessary! Edgar Cayce’s readings were filled with timeless and inspirational gems which are relevant to us all. The readings covered everything from what to do when we first wake up in the morning to how we should treat our family, friends and even our enemies, how to develop a successful business or go about making the world a better place. How do we apply these gems from day to day, not just to improve the quality of our own lives, but to fulfill our larger purpose in life? Nancy has done a lot of sifting and assimilating of these gems and will share with you some of Cayce’s insights. Hopkinsville-Christian County Historian William T. Turner and local scholar Wayne Goolsby will conduct a tour of local sites that played a role in Cayce’s life. See the site of his birth, visit his one-room schoolhouse, and tour the downtown where he worked. As a special treat to seminar participants, an exclusive visit to the office where Cayce gave readings locally is on the agenda. The tour concludes with a visit to his grave site in Riverside Cemetery. Join us for an entertaining and interactive stage experience! MacCraw is a natural at combining his skills as a stand-up comedian with the science of hypnotism to create the most fast paced professional Comedy Stage Hypnosis Show in the country today. Edgar Cayce discovered his gifts while hypnotized on a stage in Hopkinsville. Who might be next? 9am: Q&A with the Kirkpatricks, William T. Turner, and Edgar Cayce! Who can pass up the chance to ask Edgar Cayce a question or two?! The weekend concludes with a once-in-a-lifetime opportunity to question the experts. Edgar Cayce himself will be on site to discuss his life, while Sidney and Nancy Kirkpatrick will be on the panel to field questions about their on-going research on Edgar Cayce, his readings, and his legacy. Local historian William T. Turner joins the panel to offer answers to the life and culture of Hopkinsville, Edgar’s hometown, in the days of its most well-known son.